This Chinese Broccoli recipe is so simple and delicious! In Thailand, vegetable stir-fries tend to be Chinese in origin (Chinese cooking is a huge influence). 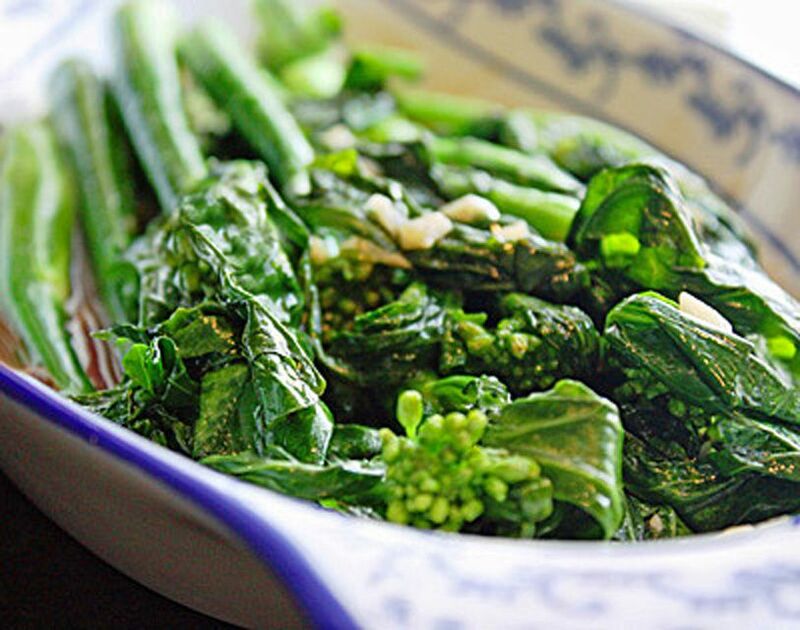 If you can't find Chinese broccoli, broccoli rabe (rapini) is a close relative that may be easier to come by (look for the organic one, which is sold in the organic section of most supermarkets these days). Our own western-style broccoli works well too―just be sure to leave on a good amount of the stem to get the texture and crunch that is desirable in Asian vegetables. Includes vegan instructions too. Thoroughly rinse your greens well to remove any grit and let drain in a colander while you prepare the stir-fry sauce. In a cup, mix together the sherry, stock, oyster sauce (or stir-fry sauce), and brown sugar. Set aside. Heat a wok or large frying pan over medium-high heat. Add 2 to 3 tbsp. oil and swirl around, then add the garlic and chili (if using). Stir-fry 30 seconds to 1 minutes (avoid over-browning the garlic―you want it still white in color, or it will taste bitter). Add the Chinese broccoli plus 2 to 3 tbsp. of the stir-fry sauce, you've made. Stir-fry until the ​wok becomes dry, then add 2 to 3 tbsp. more stir-fry sauce. Cook in this way 4 to 5 minutes. Add all the remaining stir-fry sauce and reduce heat to medium-low, so that the dish is gently simmering. Simmer until you're happy with the cooked texture of the broccoli. Tip: the stems should still taste crunchy (not too soft or soggy). If you'd like a thicker sauce, add the cornstarch dissolved in water mixture, and simmer 30 seconds to 1 minute. Remove from heat and taste-test. Add a little more sugar if too bitter (broccoli rabe is more bitter than Chinese broccoli), or a little more oyster sauce (or veg. stir-fry sauce) if not salty or flavorful enough. If too salty, add a bit of lime or lemon juice. To serve, tilt your vegetables out of the wok into a shallow serving bowl and pour any remaining sauce from the wok over top (including the garlic bits). Serve with rice and enjoy!